Never has a title of a film been more apt than Legend. At times you could compare the story of The Kray twins to that of a character from The Old West. Like Billy the Kid or Wyatt Earp, these are people we know existed but have become bigger and more than the truth of their lives. It is very telling and self-referential of the film to state in the opening scene how “everyone has a story about The Krays” and that “most are lies.” This film could probably count itself among those “lies.” If not lies, at least glorified exaggeration. This is due to the narration from the wife of Reggie Kray, Francis Shea, played by Emily Browning. She is our eyes into the world of the brothers and like many films has done before, she is also our unreliable narrator, seeing the lives of the gangsters through rose-tinted glasses. It is her story as much as The Krays and this can often detract from the tale you want to see told. Especially later when her narration begins to make little sense and you wonder why it was used or needed at all. Not that this takes away from a movie that is never less than compelling. This may be Francis Shea’s viewpoint but it is clearly a film about The Krays. From the moment they appear on-screen, they are nothing less than mesmerising, pushing the film along at a break-neck speed and offering scenes of both violence, family-love and touching humour. In fact, it is this fine balancing act that makes the movie so entertaining. It can switch so suddenly from the farcical and funny to the shocking and violent, making The Kray twins a nervous double act to watch and in some scenes, truly terrifying. 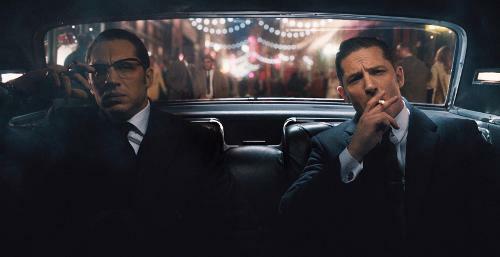 This is down to one of the best performances I’ve seen this year – or should I say pair of performances because Tom Hardy transforms himself into both The Krays in a way that is almost astonishing. On one side he is the cheeky, charming and street-wise Reggie, on the other he is the terrifying, crazy and unstable Ronnie. It is the highest praise I can offer that at times you truly forget that Hardy is playing both characters. The differences are huge but offer great subtlety at the same time. This is also down to the way the movie is directed. When the brothers are on-screen together, it is seamless. It helps pull-off the illusion. Sometimes it does feel like scenes are actively avoiding the two being on-screen together, which in the beginning becomes quite jarring, but then this film isn’t necessarily about both the brothers anyway. Reggie is clearly the main character. The film follows his story more closely and although arguably Ronnie is the more interesting of the two, Reggie gets much more of the screen-time and bulk of the tale. It makes sense considering who the narrator is but at times you want more of the unhinged, crazy sibling rather than the smooth talking gangster. This isn’t the only issue with the narration. Phrases used and the writing of Francis’ voice-over is sometimes slightly cheesy. You notice attempts to be poetic but they come across as cliché, like a call-back to the narration Jason Statham offered in Guy Ritchie’s gangster movies. It is a small issue though because the film is fantastic. Tom Hardy will captivate from beginning to end and you will find yourself pulled in to the story of the twins and wonder if their crimes and lives were all that bad after all. 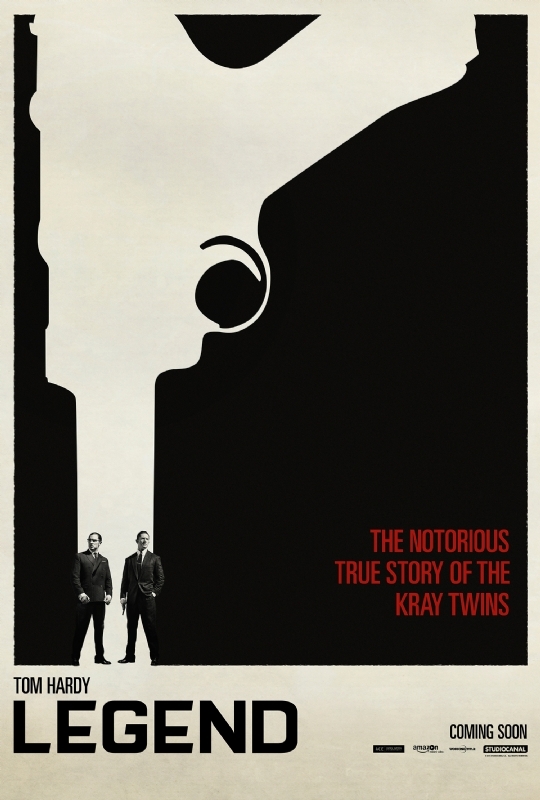 Overall, Legend does a great job of telling a somewhat romanticised version of The Kray’s story. The greatest triumph is the almost chameleon like performance by Tom Hardy as the very different brothers. There are some strange choices with the both the writing and general inclusion of the narration but this aside, being a London gangster never looked so appealing.